Stratton had a busy winter. The Harmony Turntable is the result of eight months of research with a new design; the Harmony has a larger plinth than his Eclipse with a larger sub platter, sitting within an 18lb machined, 6061 aluminum isolation platform and retaining the exquisite finishes. The aluminum platform is a very clever, effective idea and has the same profile as the ‘table. So, under review is the Pure Fidelity Harmony Turntable with Acoustic Signature TA-2000 Tonearm ($8290). Stratton suggested I review his ‘table with a Kiseki Purple Heart Moving Coil Phono Cartridge ($3199). I’ll post a review of this famous cartridge soon. My Harmony was finished in Quilted Maple (also comes in Santos Rosewood, Cherry and Walnut—high quality, automotive paint finishes in black, white and red are also available). 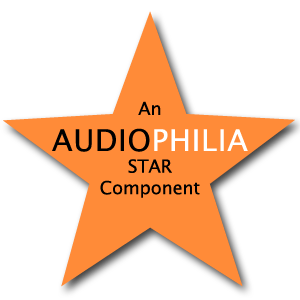 The Harmony retains the same ultra high quality workmanship as Pure Fidelity’s other products. Truly, stunning! Quilted Maple finish. Oh my! Kiseki Purpleheart wood cartridge hanging above. When I began my playing career, my father used to tell me ‘people listen with their eyes’, referring to a performer’s correct platform etiquette. As such, the Harmony will grace any music room in the finest settings before a note is played. WAF factor? Pass! We had a wine & cheese at our place the other day with three other couples. All were in awe of the Harmony’s looks. In fact, one of the ladies suggested I keep the Harmony and sell my Rega RP10, and on the Rega Wall Shelf where the RP10 sits, I can put a nice house plant! The TA-2000 Tonearm. Teutonic engineering, indeed! 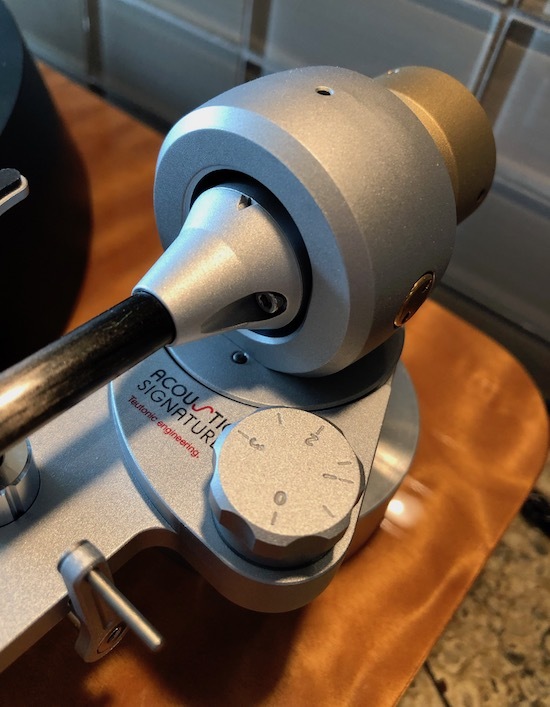 Exquisite fit & finish and a wonderful tonearm design from Acoustic Signature. The price of the Harmony with Acoustic Signature’s entry level TA-1000 Tonearm is $7290. At the TA-2000 we use precision miniature bearings from the manufacturer SKF. The bearings are added with minimal pre pressure for zero backlash to achieve a minimum friction and high stability. The arm uses our custom made dual carbon tube (it comes in either 9”, 10” or 12”. The review unit came with a 9” arm). The two pipes are joined by connecting elements. This creates a very rigid tube with a high internal damping and resonance. We use a OFC copper cable for internal wiring. The TA-2000 allows you to exactly adjust the azimuth angle. For this you simply open 3 small screws and then the arm tube can be swivelled for ± 5 degrees so the angle can be adjusted perfectly for each cartridge. 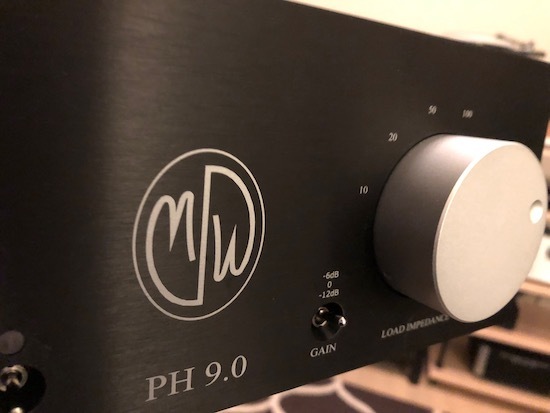 In addition to the Kiseki cart, I used the Modwright Instruments PH 9.0 Tube Phono Stage ($2900—a review of the 9.0 will be posted April 8 or 9). I also tried the Harmony with two other tubed phono stages from Allnic Audio, the H-1202 ($3750) and the mighty H-7000 ($15,000). The Harmony played beautifully with each, but the majority of the sound references in this review are sourced from the Modwright. Stratton was very kind to come over to the island to set up the turntable, which takes but a few minutes (the arm and cart were already installed—Stratton offers a variety of arms for each of his turntables chosen at purchase, or you can purchase the ‘table without an arm). The dark brown, 48mm Delrin platter had an angled edge which looked good, and is, as far as I know, unique. The angled edge is purely cosmetic and does not affect the sound in any way. All the ladies at the party preferred it to a straight edge. All the men (audiophiles, all) preferred a straight cut. Your choice when ordering. To match the heavier platter, the Harmony has a large sub platter with the same rubber O-rings found on the Eclipse. The Harmony uses two rubber belts. In place of a ball bearing at the bottom tip of the spindle, Stratton uses a ruby. A record clamp is provided. Power comes from the same control unit used with the Eclipse, a 12-volt AC synchronous motor coupled with an outboard speed controller called Maestro. Maestro comes with a separate linear power supply and has two toggle switches on its front plate, on/off and 33/45. My main goal was to introduce a new model that would add to the strengths of the Eclipse and Encore, improving on their existing characteristics, not changing them. I am very proud of the aesthetics of our turntables, but as beautiful as they are I will only add or change components if they improve the sound. Adding the solid 18 lb isolation base has improved what was already a very quiet turntable. It is a unique design. The table’s feet sit inside the machined pockets of the platform giving superb isolation due to its weight and an additional set of feet. 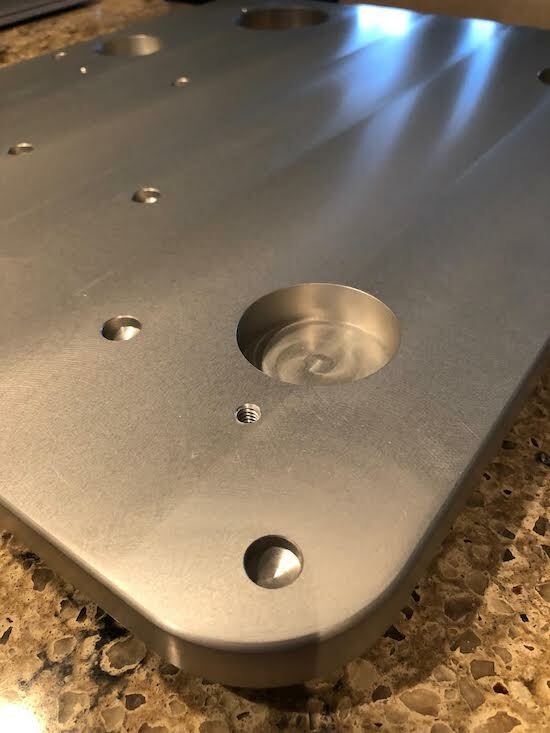 The Harmony’s 18lb isolation platform, machined in 6061 aluminum. Previously, I had mentioned (after testing many different cores) that the 2” Ultra MDF was the ultimate core for our plinths. Lightweight plinths can sound fast but most of them are too bright—of course there are some exceptions. Heavy mass plinths can sound very solid but can sound sleepy. I refer to our plinths as hybrids. They are extremely fast, yet have a great bottom end that is not at all sleepy. The second area we addressed was the platter. The new Delrin platter is 48 mm thick. This platter produces an even quieter noise floor with noticeable sonic benefits. The most obvious is the improvement in the bass resolution and even quieter noise floor. As I sat listening to glorious music, my eyes were often focussed on the visuals. The Quilted Maple, juxtaposed with the innovative aluminum isolation base with a gorgeous hunk of purple heart hanging over the whole scene, was beautifully distracting. Not to mention a wonderful looking arm. But, what value, if the sound does not match the looks? Happily, with the Harmony, we’re in analog La La Land. Stratton punched way above his weight with the $5490 Eclipse, outperforming others in his price bracket. At $8290, Stratton has done the same with the Harmony. When you’re up against the big boys like Rega, VPI and Clearaudio, you better bring it. The Harmony boasts an even lower noise floor than the already very quiet Eclipse, spins piano pitch true, and combined with the superb arm and the right cartridge, plays bass in the nethersphere. Tics and pops are mere bagatelles. Non events. Audiophiles pay for inky black backgrounds, digital or vinyl, and here you’ll get them. And, as paired with the Modwright phono stage, the music emerged from the darkest recesses of the soundstage. Thus, the most subtle musical inflections were heard. When listening to Beethoven Symphonies (Klemperer/Philharmonia/EMI) the usual tonic/dominant of the horns and trumpets almost always go unnoticed, especially pp. The Harmony allowed me to hear deep into the soundstage so these incredibly important and often ignored notes retained their harmonic importance. We audiophiles look for value in products, and the Harmony certainly has that. But as prices increase over a previous model, we want more of everything, presence, immediacy, and emotional connection, especially. Does the Harmony give its purchaser that? Yes, and more. Because the noise floor is so low, the bass spot on, the midrange and treble so balanced and sweet, each quality record will give you the emotional wallop you pay for. Cartridge dependent (no cheap and cheerful MMs, please), your will hear very clear instrument specificity (layered instrumental sections, not just ‘oh, look, check out those sweet flutes’, plural)—as in recognizing the cymbals and bass drum placement (far stage left, slightly less stage left and to the rear) in the Classic Records/Reiner/Chicago Pictures at an Exhibition, ‘Gnomus’ cut. Many ‘tables get the combined thump, splash and hall decay, but not the drum and cymbal separated as you would experience in the hall. It may sound wonderful and is very effective, but it’s not musically or sonically accurate. I played this record over and over again—it was a treat to hear such precise imaging. Another reach for the stars product, my Rega RP10 Turntable can replicate it, but only with the $15,000 Allnic H-7000 Phono Stage. The Harmony was as clear but with a $2900 phono stage. It was bringing its A game—the Harmony’s technological refinement was a big part of the sound story. Voice recordings such as the Classic Records reissue, Belafonte at Carnegie Hall, Dusty/Casino Royale/’The Look of Love’ and a newcomer to me, Mary Coughlan, sounded in the moment, with every emotion and vocal inflection heard and experienced. The well recorded Belafonte/Carnegie applause (if you are not aware, a superb test for the whole analogue chain) was not of the cat on a hot tin roof variety as heard on lesser gear. It was beautifully robust—without being silly, you get the palm cup as well as the slap echo. If you remember the Stereophile review(s) talking about differences in sound quality when wearing larger or smaller reading glasses and ‘combing’ the carpet pile in different directions, you may want to cut me slack on my ‘palm cup’. Belafonte’s recording is as famous as Mary Coughlan’s 1985 debut recording is not (Tired and Emotional—WEA Records). It should be. It’s a gem of the Irish balladeer style, girl redux. It’s also a knockout recording with the most tactile acoustic guitars I’ve heard in a while. Coughlan’s had a rough old go in the ensuing years—divorce, addiction, jail, hospitalization, etc. But, now, she’s going strong. As a debut album, Tired and Emotional is remarkably assured. Her mezzo sounds lively and interesting on the Harmony, with the Kiseki and Modwright adding to the glorious sound. Fans of the style and audiophile recordings, grab this LP. I just ordered it used on Amazon for CAD$20. Thanks to John Stratton for introducing it to me. With a turntable and arm combo of such fine quality, you could hang a Goldfinger Statement cart and it would party just fine. As such, the Harmony is perfect for the vinylphile’s sky’s-the-limit demands, present and future. To get into lifetime ‘tables, you have to look at Spiral Groove, the big SMEs, the Clearaudio Innovation or go Bergmann Audio (the Magne is coming to the island for a follow up @ CAD$18,000). All brilliant—all very expensive. $8290 for a Harmony with the upgraded Acoustic Signature arm is no cheap date, but if you’re serious about transitioning to a superior analog level, you should audition one before plonking down double the cash on something else. Very highly recommended.